McLaren and Honda have shared a winning partnership in the past that both would love to rekindle, 2015 therefore represents a first step toward the team returning to winning ways. I've made my thoughts clear in the past that McLaren (and indeed Ferrari) lost their way after SpyGate, something that can be seen from the results post 2008. On top of this the sport has since undergone a change in ethos, something the two giants of the sport were perhaps un-prepared for in terms of resources and personnel, with more focus on CFD and Wind Tunnel testing rather than pounding around test tracks. 2015 can therefore be seen as a reset for McLaren, 2014 being an interim year where they phased out their 21 year relationship with Mercedes-Benz who'd provided the team with success throughout, making way for Honda to once again supply them as a works team. Aero had been highlighted as a problem area for the team over the last few years and so effort has been made to restructure that department with Peter Prodromou re-joining the fold from Red Bull Racing as chief engineer, whilst Honda themselves will be keen to help as best they can, with the Japanese marque likely to have retained a small working group to focus on the technical regulations. Having made the jaunt from Milton Keynes to Woking, Peters hand in the design philosophy started to bear fruit toward the end of 2014 with the team trialing a Red Bull-esque front wing in Abu Dhabi. 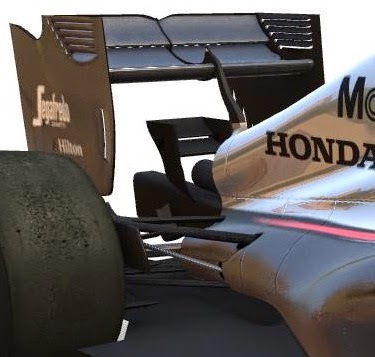 The MP4-30 render shows a very similar design and so we can surely expect an evolution of this concept throughout 2015. The nose as we have seen already from previous launches has exposed several different design concepts, all of which have tried to minimise the nose length, exposing the neutral section of the front wing to a less disturbed airflow pattern that can be manipulated by the structure above. 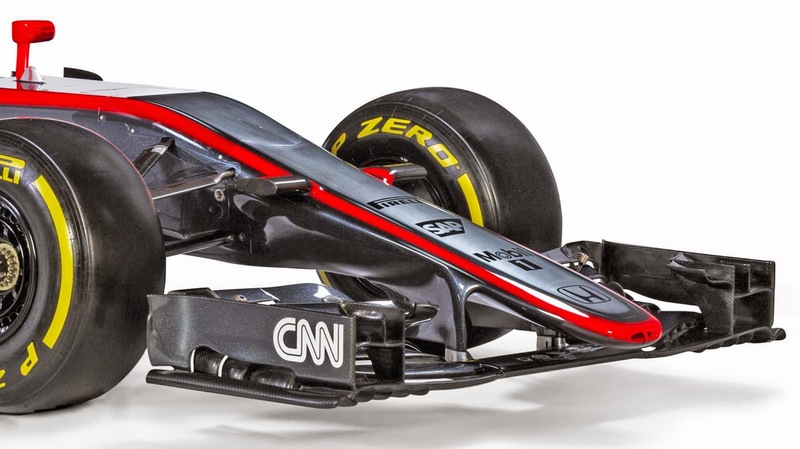 McLaren however have increased their nose beyond the front wing neutral section but opted for the widest (140mm) but shortest section 50mm behind the tip, similarly with the 20000mm2 cross section 100mm aft of this, making for a steady nose incline, close to what the FIA intended. 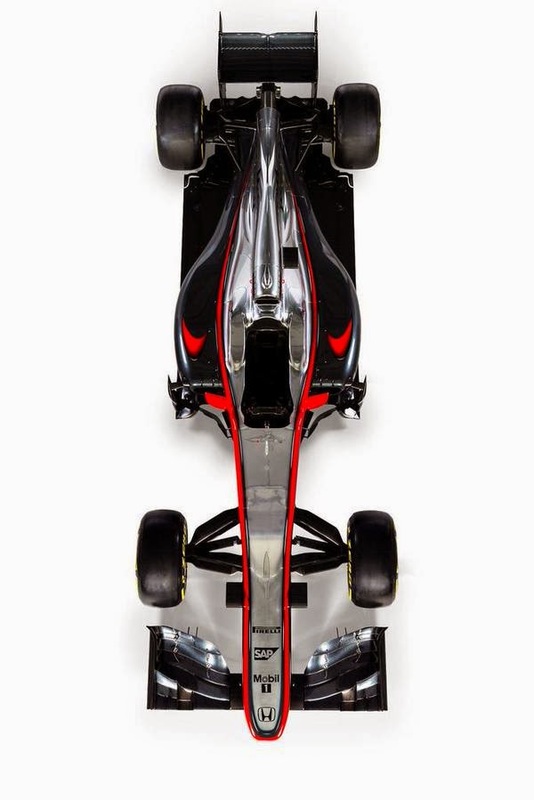 What we must remember is that this is an early render of the MP4-30 and McLaren may intend to introduce a fresh nose later on when they can pass the crash test (passing the crash test for a shorter nose presents more issues, as the impact must be decelerated over a shorter period). 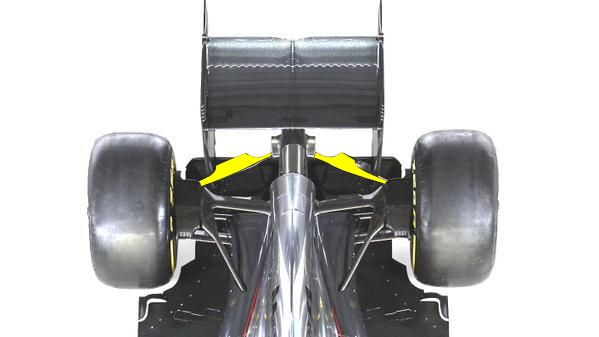 The widest possible front wing pylons have been retained and are sculpted in much the same way as the cars predecessor with the trailing edge positioned inboard. The camera mounts have been positioned at the top of the nose, in a similar vein to the handlebar approach used by Mercedes, Ferrari and Red Bull last season, albeit not as pronounced as the regulations don't permit that. Although it has (as Mercedes did in 2014) required the team to slope the upper surface of the chassis in order to meet with the nose (as is noted by the large access/vanity panel). 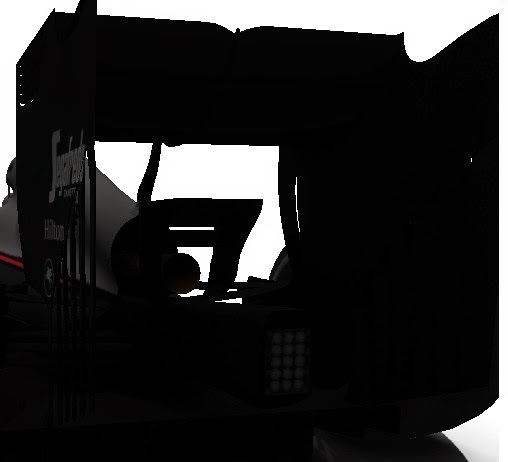 The turning vanes aren't shown in the render so it'll be interesting to see what these look like during testing. Typical of McLaren the airbox has been divided up into 2 horizontal sections with one feeding the engine and the other an assortment of oil coolers. The sidepods are definitely an improvement on last season as we know were bloated based not only on the original concept but also the orientation and number of radiators/intercoolers in use. 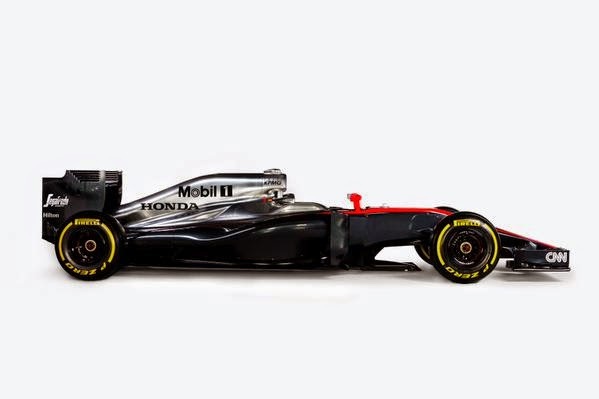 It'll be interesting to see a naked MP4-30 in the coming weeks to see how the layout differs from last year. Meanwhile the space ahead and on top of the sidepods is proliferated by a similar array of vortex generators, cockpit fins, bargeboards, airflow conditioners we saw the team use throughout 2014, this is an area we may see evolve during testing. The rear of the sidepods is where they have lost the most bloat though with the upper cannons deleted, leading to a lower and much slimmer set of cooling outlets, increasing the free space in the coke bottle region. Interestingly at the rear of the car the splayed suspension layout used to mount the 'wishbone wings' upon seems to have been retained (marked in yellow), now whether that is to do with understanding that suspension geometry or whether the wings will be added later remains to be seen. The rear wing has lost some of the extension of the strakes that were used on the MP4-29 but what is most apparent is the lack of central support pylon, much like the Williams FW36/7 (are they going to try and do what I believe Williams were doing with theirs in 2014 too though?). Without the Beam Wing this puts an onus on the rigidity of the endplates, although like Williams they actually ran a floor level beam wing in 2014. Without the centralised pylon the hydraulic pipework associated with DRS must also be passed through the endplates which also house the actuators (like the Mercedes W03) as no centre pod actuator is present. The mini strakes used at stages last season to control how the vortex was shed off the trailing edge of the endplate are back (green), whilst the gradient slots used by Red Bull at the start of 2014 and then trialled by Ferrari late in the season have also emerged (red), which assist in creating consistent downforce whilst reducing drag. At the German GP last season the team introduced a new rear wing which used Tubercles on the trailing edge of the mainplane and leading edge of the top flap (yellow), which also appear on the render. As always seems to be the case with McLaren they provide a launch render and then provide a 360 degree application that shows elements that appose the render. In the case of the MP4-30 this seems to centre around the rear wings design with the 360 showing a centralised swan neck pylon extending out of the engine cover (much like Red Bull's later designs did in 2014) and a new Y100 winglet (much the same as the Red Bull design again, albeit mounted on the crash structure rather than another lower winglet) whilst the leading edge tyre wake slot used on the MP4-29 is also present along with the extended endplate strakes. Much has been made of the token system and Honda's return, especially as how it would have been so unfair that the manufacturer not be able to develop throughout the season like the others. 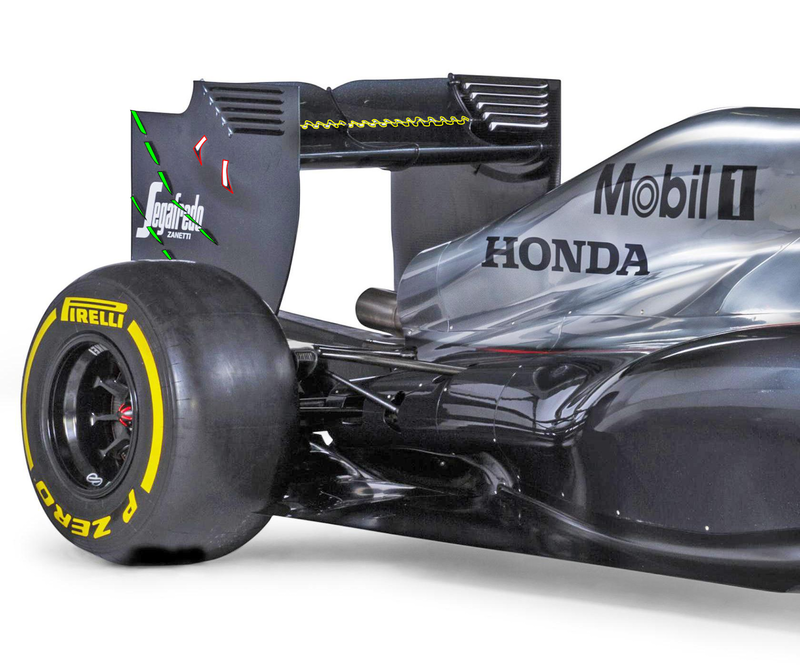 However where Honda did/does have one advantage over the other manufacturers is that they return in a year where variable inlet trumpets are allowed, something that the 2014 powerunits didn't feature. Had the FIA allowed carte blanche to Honda (ie the full 32 token allocation) they'd have saved many over their counterparts who have to make the changes to assimilate them. I'm not by any means saying that variable inlets are a game changer but they do offer a performance advantage whereby you can smooth the powerband, which may have been being done by the turbo, MGU-H, MGU-K, fuelling etc configurations last season, freeing up development scope. 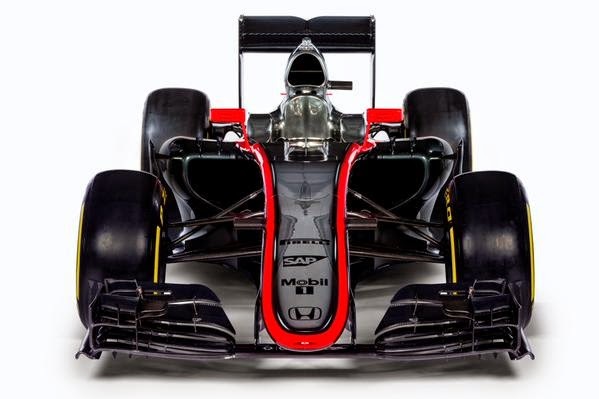 I look forward to seeing what the McLaren-Honda partnership can achieve, will it have success in 2015? It would need an extraordinary leap but never say never.